A new Avengers: Endgame TV spot has been unveiled by Marvel Studios. Sadly, it does not feature any new footage, but it does offer up more of Captain America's rallying speech. Marvel Cinematic Universe fans are treated to mostly black and white footage with hints of red from the past, which seems like it will be just as important as the future in the upcoming movie. The Russo Brothers have admitted to throwing in footage to misdirect fans, but this isn't the case this time around. 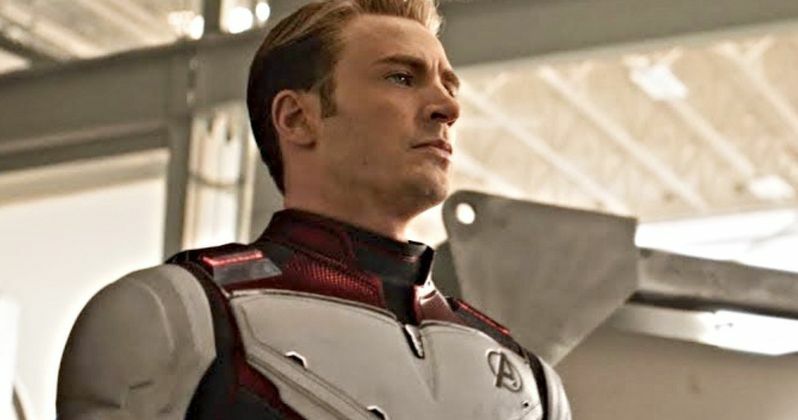 While the latest Avengers: Endgame TV spot gives us more of Cap's speech, it is unclear where it takes place in the movie. Marvel Studios usually only pulls promotional material from the first half of a project, so it would make sense that the heroes have gathered and are about to embark on their seemingly impossible mission towards the beginning of the movie. Steve Rogers is clearly leading the team as shown off in the TV spot and the recently released second trailer, while Tony Stark looks a bit unsure of everything in the back of the line. The Quantum Realm suits are shown again at the end of the Avengers: Endgame TV spot as Earth's Mightiest Heroes march into the unknown. It's still a mystery as to how the mysterious realm will be able to help defeat Thanos or how Scott Lang was able to escape in the first place, but it is believed that Tony Stark, Lang, and Bruce Banner figured out a way to manipulate Hank Pym's technology for their own purposes. With that being said, it definitely won't be just as easy as going back in time to reverse the Decimation. Marvel Studios has been extra careful with the Avengers: Endgame promotional material. Even as more LEGO sets are announced and t-shirt designs roll out, we're still left in the dark as to what will actually happen when the movie hits theaters at the end of April. It's amazing how studios as big as Marvel and Lucasfilm are able to keep everything under wraps so well for so long. Not giving your actors the entire script is a good start, but even these crew members and the hundreds of digital effects artists keep their mouths shut. Avengers: Endgame hits theaters on April 26th and if Marvel Studios follows the same pattern as Infinity War, the red carpet World Premiere will not occur until a few days prior to the release date. However, there were still people online posting spoilers a few days beforehand, so be on the lookout for certain sites that like to ruin the fun just because they can. While we wait for Avengers: Endgame to arrive, you can watch the latest TV spot before and get caught up in Cap's rallying speech below, thanks to the Marvel Entertainment YouTube channel.